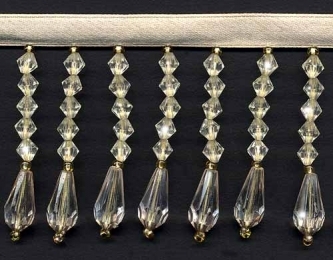 From our Decor Collection: This stunning clear ivory beaded fringe trim is 2" in length, not including the 3/8" ivory satin ribbon. The transparent beads are accented with seed beads in gold. The Decor Collection is a fabulously heavy and beautiful beaded fringe trim, perfect for wedding decorations.